Finally, the U2 Upgrade is complete. Release 1.0 is available on the download page. You can read all about it here. If you don’t want all the details, then let me say just this – you can now disable autosave, save on galaxy maps, and save on your vehicle. Oh, and most of the text is lowercase now, too! I’ve also added two more related packages to the downloads page: Xenerkes Dragon’s Ultimatrix, and Wiltshire and Aradindae Dragon’s U4 VGA/MIDI Upgrade! ‘ve just finished up release 0.3 of the U2 Upgrade, now in Beta flavor. Please download from here. The game is (finally) much more stable; dungeons, towers, view helms, and outer-space are all functional; and you can play the game from start to finish. You can read all the details here. I have a new release of the U2 Upgrade available, (alpha 0.2). It’s a little more stable than it was before and has increased compatibility with newer systems. The Galaxy Map Patch is also now included, with Moonstone Dragon’s blessing of approval. 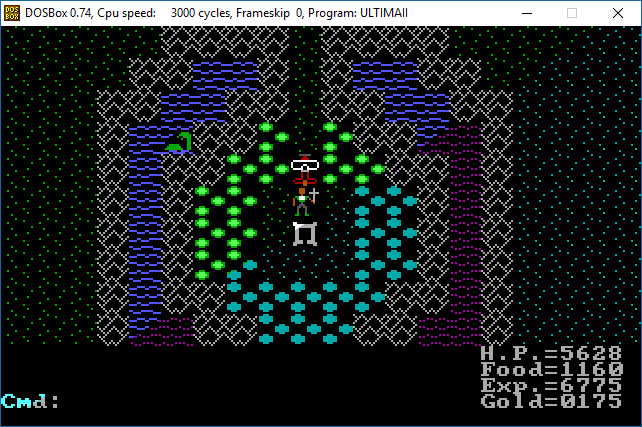 What was once known as the “Ultima III Upgrade Project” is no longer. It has evolved beyond its original being. Another soul has joined the chorus of its predecessors and crossed over into another plane of existence. It has taken its first step towards completing its Exodus. Translation: It is my pleasure to announce that the first pre-release of the U2 EGA Upgrade is now available. Please see the U2 project page for details. Since this game cannot be included under the former “U3 Upgrade” title of the web site, it only made sense that I should refit the site to accommodate more than one upgrade project.